Table 1. Descriptive analysis of salmonellosis in southern Brazil by year (2010–2015). Table 2. Salmonella serotypes and antimicrobial resistance level in southern Brazil. Nontyphoidal Salmonella serotypes are the main cause of human food-borne infection, including several hospitalization cases in the developing countries. To detect the main serotypes and to characterize the antibiotic resistance of human non-enteric and enteric nontyphoidal Salmonella from clinical isolates in Brazil. Salmonella serotypes were identified by microbiological and molecular methods. Susceptibility testing to antibiotics was performed by agar disk diffusion. Real-time PCRs were carried out for the detection of the genus Salmonella as well as serotypes Typhimurium and Enteritidis. A total of 307 nontyphoidal Salmonella were isolated from 289 different patients in a reference laboratory (LACEN-RS) from Southern Brazil in a six-year period (2010–2015). There were 45 isolates from emerging cases and 244 from sporadic cases in hospitalized patients. Non-enteric isolates were detected in 42.6% of the patients from sources such as urine, blood and other clinical fluids. Serological and PCR-specific tests demonstrated that Typhimurium (48.4%) and Enteritidis (18.3%) were the most frequent serotypes. Typhimurium isolates were generally resistant to three or more antibiotic classes, while Enteritidis isolates to one or two classes. Typhimurium was the most frequent serotype in all samples (48.4%), mainly among the hospitalized patients (55.6%), and presented the highest rates of multidrug resistance (59.3% of the isolates of this serotype). Further, the prevalence of this serotype increased along the years of the study in comparison to other nontyphoidal Salmonella serotypes. Greater public health attention should be given to prevent salmonellosis in the community and in hospital settings to reduce the rates of Typhimurium strains with multidrug resistance. This study describes the serotype distribution and antimicrobial resistance of NTS isolated from enteric and non-enteric human samples in southern Brazil in a six-year period (2010–2015). In addition, antimicrobial resistance patterns were also investigated in most NTS isolates. A total of 307 Salmonella isolates were obtained from a laboratory-based surveillance network for enteric pathogens coordinated by the Bacteriology Division from the Central Public Laboratory of the Rio Grande do Sul State (Laboratório Central do Estado do Rio Grande do Sul, LACEN-RS). All these samples were originated from clinical samples collected from cases of salmonellosis in hospitalized patients or ongoing emerging cases in the southernmost Brazilian State, Rio Grande do Sul. Epidemiological data (collection date/season of the year, local/city of collection, clinical sample) were also gathered from the 13 regional clinical laboratories (Coordenadorias Regionais de Saúde – CRSs) of the complete network in Rio Grande do Sul state (with 18 laboratories) and provided by LACEN-RS. DNA extraction of the bacterial isolates was performed by boiling method as described previously.22 A real-time PCR targeting invA gene was carried out for Salmonella generic detection and a duplex real-time PCR targeting fliA-IS200 and safA genes was used for the specific detection of the serotypes Typhimurium and Enteritidis, respectively. Primers/probes sequences and amplification conditions were previously described.23,24 All experiments were carried out in the StepOnePlus™ Real-Time PCR Systems (Thermo Fisher Scientific, Waltham, Massachusetts, USA) with cycling conditions of 95 °C for 3 min, followed by 40 cycles of 95 °C for 15 s and 60 °C for 60 s. Negative and positive controls were added in all PCRs. Data were analyzed using the Statistical Package for Social Sciences (SPSS, version 23.0, Chicago, IL). The Pearson's chi-squared test of independence and/or Fisher's exact test were used to verify possible statistical differences between the qualitative variables. Residual adjustment analysis was used to identify the resistance profile of the serotypes to the antimicrobials evaluated. All statistical tests were two-sided and p values < 0.05 were considered as statistically significant. All the 307 isolates were submitted to the invA real-time PCR and presented positive result to Salmonella. The number of isolates by year was not constant and ranged from 34 in 2010 to 72 in 2012. In addition, there was a similar rate of the Salmonella isolates in Spring (1st September to November 30th) (89, 29%), Summer (1st December to 28th February) (87, 28.3%) and Autumn (1st March to 31th May) (80, 26.1%), but it was observed a reduction of the number of isolates in Winter (1st June to 31th August) (51, 16.6%). All Salmonella isolates were originated from 44 different sub-regions from the Rio Grande do Sul state, covering all geographic macro regions and the most important urban centers in southern Brazil (Fig. 1). The highest number of isolates was obtained in the metropolitan area from the state's capital Porto Alegre (CRS1) with a total of 117 (57.7%) samples, while there was only one isolate in two regions (CR13 and CRS17). No Salmonella isolates were obtained in five macro-regions (CRS7, CRS11, CRS12, CRS15 and CRS16). Salmonella serotypes most commonly reported (number of isolates) in clinical samples of the different macro-regions (CRSs) from southern Brazil. Each circle represents the frequency of the serotypes Enteritidis, Typhimurium and others in the different macro-regions (CRSs). The total 307 isolates were from 289 different patients and overall socio-demographic information is demonstrated in Table 1. Salmonellosis frequency was higher in adults with 45 years old or more (105, 36.3%) than in other ages, but there was also an important number of children below five years (54, 18.7%), children and adolescents (34, 11.8%) and adults with less than 45 years old (89, 30.8%). Salmonella was isolated from several different human clinical specimens and classified into non-enteric (blood, urine, abscesses, biological fluids, and aspirates) and enteric (stool) samples according to the source of each sample. Among non-enteric samples 79 (64.2%) were considered invasive because they were isolated from the blood and other clinical fluids such as cerebrospinal, pleural, synovial and ascites (Table 1). Descriptive analysis of salmonellosis in southern Brazil by year (2010–2015). Sterile fluids: cerebrospinal (n = 2), ascetic (n = 1), synovial (n = 1), and pleural (n = 1). A total of 287 isolates from S. enterica subsp. enterica and two isolates from S. enterica subsp. houtenae were detected in the six-year period spanning this study. TS serotypes Typhi and Paratyphi were not detected among the isolates from the subspecies enterica, so all 289 isolates were NTS. The scenario is clearly dominated by serotypes Typhimurium and Enteritidis (193, 66.7%; p < 0.01). Typhimurium was the most frequent one with 140 (48.4%; p < 0.01) isolates, while Enteritidis was detected in 53 (18.3%) of the samples. All these isolates also presented positive result only for the respective serotype in the duplex real-time PCR targeting fliA-IS200 and safA genes. Among the remaining isolates of the subspecies enterica, 83 (28.7%) were from 21 different serotypes and 11 (3.8%) were not completely serotyped (Table 2). All the 83 isolates of the 21 serotypes and seven samples with incomplete antigenic formula presented negative results in the duplex real-time PCR, but the remaining four isolates presented PCR positive result for serotype Typhimurium (all of them with the antigenic formulae O:4,5). With these four isolates, the prevalence of Typhimurium rises to almost half (144, 49.8%) of all samples. These serotypes were isolated in all regions of the state (Fig. 1). Salmonella serotypes and antimicrobial resistance level in southern Brazil. The overall number and frequency of Enteritidis isolates was higher than Typhimurium (and also than the others serotypes) in 2010. The reverse situation (first Typhimurium, second Enteritidis) occurred in 2011. Typhimurium was significantly more frequent than Enteritidis in the other following 4 years (p < 0.01) (Fig. 2A). Epidemiology of human salmonellosis in southern Brazil, 2010 to 2015. (A) Salmonella isolates from all samples. (B) Salmonella isolates from hospitalized patients. The isolates were classified into three serotypes groups: Typhimurium, Enteritidis and others. Salmonella isolates of this study were from sporadic cases in hospitalized patients or associated with ongoing salmonellosis emerging cases. Most isolates (244; 84.4%) were from hospitalized patients and occurred in all geographic macro regions of southern Brazil. Typhimurium was more frequent than all other serotypes, with 135 (55.6%; p < 0.01) isolates, followed by Enteritidis (33; 13.6%). The sum of the other serotypes reached 75 (30.9%) isolates. Interestingly, the overall number and frequency of Typhimurium isolates was much higher than any other serotypes in all years, ranging from 40% in 2010 to 67.7% in 2015 (Fig. 2B). The remaining 45 isolates were related to 23 regional food-borne salmonellosis emerging cases (9 in 2010, 6 in 2011, 3 in 2012, 4 in 2014 and 1 in 2015). These emerging cases were more frequent in Summer (12, 52.2%), but they were also reported in the three other seasons: Spring (6, 26.1%), Autumn (4, 17.4%) and Winter (1, 4.3%). There were 21 emerging cases with the identification of only one serotype: Enteritidis (14; 60.4%), Typhimurium (3, 14.3%), Infantis (1; 4.8%), Braenderup (1; 4.8%), Corvallis (1; 4.8%) and Johannesburg (1; 4.8%). Noteworthy, there was one important emerging outbreak caused by serotype Infantis with eleven (24.4%) isolates, while all the other ones had only two to four isolates. In one case, two Salmonella serotypes were detected (Agona and Typhimurium). A total of 280 (91.4%) NTS isolates were submitted to antimicrobial susceptibility with 12 antibiotics and classified into susceptible and resistant. Sixty-eight (24.3%) were sensitive to all of them, while the other 212 (75.7%) isolates presented resistance to one or more antibiotics. Among these last isolates, 108 (38.6%) were resistant to one or two antimicrobials categories, while the other 104 (37.1%) were resistant to three or more drugs and were considered MDR (Table 2). In an individual evaluation of each antibiotic, it is noteworthy the high frequency of the resistance to Nal (167, 59.2%), Tet (106, 37.6%), Amp (99, 35.1%), Nit (98, 34.2%), Str (92, 32.6%), Gen (54, 19.1%), Cip (44, 15.6%), Clo (43, 15.2%) and Tm/Sut (33, 11.8%). Two other antibiotics showed resistance rates below 5%: Cfo (8, 2.8%) and Caz (4, 1.4%). In the analysis of the antibiotic resistance according to the serotype, most Typhimurium isolates presented resistance to three or more antibiotics, while the majority of the Enteritidis isolates presented resistance to two antibiotics and most of the other serotypes were susceptible to all tested antibiotics (Table 2). In the analysis of the resistance to different antibiotics categories, Typhimurium was the serotype with the highest number of MDR isolates (83, 72.2%; p < 0.01). Interestingly, twelve (14.4%) Typhimurium isolates presented the multi-resistant profile ACSSut (resistance to ampicillin, chloramphenicol, streptomycin, sulfamethoxazole, and tetracycline). In addition, ten (8.7%) Enteritidis isolates and 22 (19.1%) of the other serotypes also were MDR (Table 2). An overall view of the antibiotic resistance according to serotypes (Typhimurium, Enteritidis and others) is demonstrated in Fig. 3. Antimicrobial resistance rate of different antimicrobial agents in nontyphoidal Salmonella in southern Brazil, 2010 to 2015. The isolates were classified into four serotypes groups: Typhimurium (blue), Enteritidis (red), others (green), and with incomplete antigenic formulae (purple). Antimicrobial resistance was classified according the following antibiotics classes: aminoglycosides (Str, streptomycin, Gen, gentamicin), cephalosporins (Caz, ceftazidime, Cfo, cefoxitin), penicillins (Amp, ampicillin), quinolones (Nal, nalidixic acid, Cip, ciprofloxacin), tetracyclines (Tet, tetracycline), phenicols (Clo, chloramphenicol), folate pathway inhibitors (Tm/Sut, trimethoprim/sulfamethoxazole), nitrofurans (Nit, nitrofurantoin) and carbapenems (Imp, imipenem). Continuous surveillance of Salmonella epidemiology is necessary to monitor trends in serotypes distribution, to prevent spreading of iNTS and to detect drug resistance. This study provided the current serotype prevalence, clinical sources and antibiotic resistance among strains isolated from humans with salmonellosis in southern Brazil. Typhimurium was the most frequent serotype in enteric and non-enteric samples and usually presented MDR. In addition, it was the most frequent serotype detected in hospitalized patients with salmonellosis. New studies are necessary to characterize better the transmission pathways in community and hospitals settings to prevent contamination by this concerning bacteria. The authors thank the Bacteriology Department and others members of LACEN-RS for their collaboration in the development of this study, the staff of the Molecular Diagnostics Laboratory of Lutheran University of Brazil (LDM-ULBRA) who performed technical support and the National Reference Laboratory for Cholera and Enteric Diseases, Oswaldo Cruz Institute (FIOCRUZ, Rio de Janeiro, Brazil) for the complete antigenic characterization and serotype identification. This work was funded by ULBRA and Simbios Biotecnologia. NI and VRL were also financially supported by the National Council for Scientific and Technological Development from Brazil (CNPq – Conselho Nacional de Desenvolvimento Científico e Tecnológico; process numbers 313564/2014-0; 313304/2014-9). This study was financed in part by the Coordenação de Aperfeiçoamento de Pessoal de Nível Superior – Brasil (CAPES) – Finance Code 001. RSR, MNS and JMW were further supported by the Coordination for the Improvement of Higher Education Personnel from Brazil (CAPES – Coordenação de Aperfeiçoamento de Pessoal de Nível Superior; process number 181 – 18/12/2012). EFSA – European Food Safety Authority. The European Union summary report on trends and sources of zoonoses, zoonotic agents and food-borne outbreaks in 2015. J.J. Gilchrist, C.A. MacLennan, A.V. Hill. Genetic susceptibility to invasive Salmonella disease. J.A. Crump, M. Sjölund-Karlsson, M.A. Gordon, C.M. Parry. Epidemiology, clinical presentation, laboratory diagnosis, antimicrobial resistance, and antimicrobial management of invasive Salmonella infections. Salmonella and Salmonellosis in Southern Brazil: a review of the last decade. G.C. Buckle, C.L. Walker, R.E. Black. Typhoid fever and paratyphoid fever: systematic review to estimate global morbidity and mortality for 2010. O. Gal-Mor, E.C. Boyle, G.A. Grassl. Same species, different diseases: how and why typhoidal and non-typhoidal Salmonella enterica serovars differ. E. Scallan, R.M. Hoekstra, F.J. Angulo, et al. Foodborne illness acquired in the United States-major pathogens. A.H. Haselbeck, U. Panzner, J. Im, S. Baker, C.G. Meyer, F. Marks. Current perspectives on invasive nontyphoidal Salmonella disease. S.A. Fernandes, A.T. Tavechio, A.C. Ghilardi, A.M. Dias, I.A. Almeida, L.C. Melo. Salmonella serovars isolated from humans in São Paulo State, Brazil, 1996–2003. R. Capalonga, R.C. Ramos, J.M. Both, et al. Salmonella serotypes, resistance patterns, and food vehicles of salmonellosis in southern Brazil between 2007 and 2012. B.R. Pribul, M.L. Festivo, M.M. de Souza. Characterization of quinolone resistance in Salmonella spp. isolates from food products and human samples in Brazil. A.I. Switt, Y. Soyer, L.D. Warnick, M. Wiedmann. Emergence, distribution, and molecular and phenotypic characteristics of Salmonella enterica serotype 4,5,12:i:-. Antimicrobial drug resistance in Salmonella: problems and perspectives in food- and water-borne infections. L.H. Gould, K.A. Walsh, A.R. Vieira, et al. Surveillance for foodborne disease outbreaks – United States, 1998–2008. M. Helms, P. Vastrup, P. Gerner-Smidt, K. Mølbak. Excess mortality associated with antimicrobial drug-resistant Salmonella typhimurium. Antigenic formulae of the Salmonella Serovars. M. Guibourdenche, P. Roggentin, M. Mikoleit, et al. Supplement 2003–2007 (no. 47) to the White-Kauffmann-Le Minor scheme. CLSI – Clinical and Laboratory Standards Institute. Performance standards for antimicrobial susceptibility testing; twenty-four Informational Supplement; M100-S24. Wayne, PA.
C. Soumet, G. Ermel, P. Fach, P. Colin. Evaluation of different DNA extraction procedures for the detection of Salmonella from chicken products by polymerase chain-reaction. J. Hoorfar, P. Ahrens, P. Rådström. Automated 5’ nuclease PCR assay for identification of Salmonella enterica. S. Maurischat, B. Baumann, A. Martin, B. Malorny. Rapid detection and specific differentiation of Salmonella enterica subsp. enterica Enteritidis, Typhimurium and its monophasic variant 4,,12:i:- by real-time multiplex PCR. T.T. Ao, N.A. Feasey, M.A. Gordon, K.H. Keddy, F.J. Angulo, J.A. Crump. Global burden of invasive nontyphoidal Salmonella disease, 2010. I.V. Uche, C.A. MacLennan, A. Saul. A systematic review of the incidence, risk factors and case fatality rates of invasive nontyphoidal Salmonella (iNTS) disease in Africa (1966 to 2014). E.C. Rodríguez, P. Díaz-Guevara, J. Moreno, et al. Laboratory surveillance of Salmonella enterica from human clinical cases in Colombia 2005–2011. F.A. de Castro, V.R. dos Santos, C.H. Martins, S.A. Fernandes, J.E. Zaia, R. Martinez. Prevalence and antimicrobial susceptibility of Salmonella serotypes in patients from Ribeirão Preto, São Paulo, Brazil, between 1985 and 1999. T.F. Jones, L.A. Ingram, P.R. Cieslak, et al. Salmonellosis outcomes differ substantially by serotype. P.J. Ceyssens, W. Mattheus, R. Vanhoof, S. Bertrand. Trends in serotype distribution and antimicrobial susceptibility in Salmonella enterica isolates from humans in Belgium, 2009 to 2013. A.L. Miranda, S.M. Cordeiro, J.N. Reis, L.G. Cardoso, A.G. Guimarães. Phenotypic and genotypic characterization of Salmonella spp. isolated from foods and clinical samples in Brazil. F.E.A. Assis, C.B. Dallagassa, Farah SMSS, et al. Molecular characterisation of Salmonella strains isolated from outbreaks and sporadic cases of diarrhoea occurred in Paraná State, South of Brazil. J.D. Kich, A. Coldebella, N. Morés, et al. Prevalence, distribution and molecular characterization of Salmonella recovered from swine finishing herds and slaughter facility in Santa Catarina, Brazil. A.M. Smith, M.A. Mthanti, C. Haumann. Nosocomial outbreak of Salmonella enterica serovar Typhimurium primarily affecting a pediatric ward in South Africa in 2012. V.K. Kozyreva, E.N. Ilina, M.V. Malakhova, et al. Long-term dissemination of CTX-M-5-producing hypermutable Salmonella enterica serovar Typhimurium sequence type 328 strains in Russia, Belarus, and Kazakhstan. D. Voss-Rech, L. Potter, C.S. Vaz, et al. Antimicrobial resistance in nontyphoidal Salmonella isolated from human and poultry-related samples in Brazil: 20-year meta-analysis. A.M. Smith, M.A. Mthanti, C. Haumann, et al. GERMS-SA surveillance network. Nosocomial outbreak of Salmonella enterica serovar Typhimurium primarily affecting a pediatric ward in South Africa in 2012. 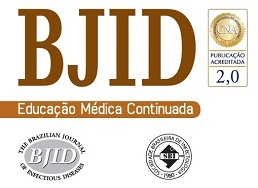 F. Almeida, A.A. Seribelli, P. da Silva, et al. Multilocus sequence typing of Salmonella typhimurium reveals the presence of the highly invasive ST313 in Brazil. R.B. Rau, D. de Lima-Morales, P.L. Wink, A.R. Ribeiro, A.F. Martins, A.L. Barth. Emergence of mcr-1 producing Salmonella enterica serovar Typhimurium from retail meat: first detection in Brazil. F. Almeida, M.I. Medeiros, P. Rodrigues Ddos, J.P. Falcão. Genotypic diversity, pathogenic potential and the resistance profile of Salmonella typhimurium strains isolated from humans and food from 1983 to 2013 in Brazil.